This Friday (May 21st, 2010) the U.S. Fish and Wildlife Service and several conservation organizations will observe Endangered Species Day. We've spent some time this week learning more about the endangered animals and what we can do to help those animals out. One way to learn about endangered animals is through play. 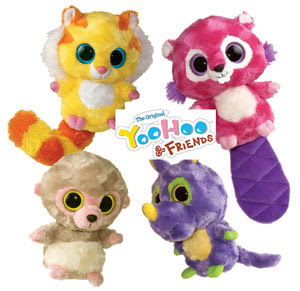 Aurora World, Inc., a toy and gift manufacturer, has a line of cute plush toys called YooHoo & Friends. The designs are based mostly on endangered animals from around the world. My daughter and son instantly fell in love with these unusual and colorful stuffed animals - those big-eyes are hard to resist. 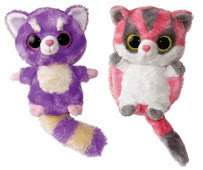 We received two 5" animals: pink Sugar Glider (Shooga) and a purple Lesser Red Panda (Hapee). Both the animals make a noise when you squeeze their bellies. All the various stuffed animals are affordable and range in cost between $7-$14 (with the exception of the giant animals). My daughter loves the sugar glider marsupial best, and has fun pretending to make it fly through the air. The sugar glider is from Australia and the surrounding islands, and we located its homeland on a world map and read about the animal online. According to Wikipedia, the sugar glider is not endangered but protected (some close relatives like Mahogany Glider are endangered). Some people keep sugar gliders as domestic pets! 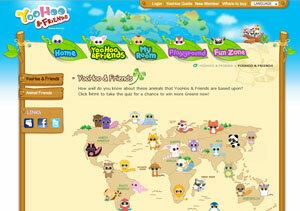 The tags on the smaller animals don't contain much information about the animals, but kids can find out more about their YooHoo & Friends animals if they visit the free, interactive website at www.yoohoofriends.com. We found our animals on the animal map and learned more about each animal and it's habitat. There's plenty of games featuring the YooHoo & Friends animals to play on the website and kids can even choose a pet and decorate their pet's room in the My Room section. Aurora World Inc. has kindly offered to giveaway a random five inch animal from the YooHoo & Friends line to a Brimful Curiosities reader. The exact animal the winner will receive is a surprise! To enter, leave a comment relevant to this post or comment with an endangered species you think would make a good YooHoo & Friends character. How about the American Black Bear? I follow you on Twitter & tweeted about the giveaway. 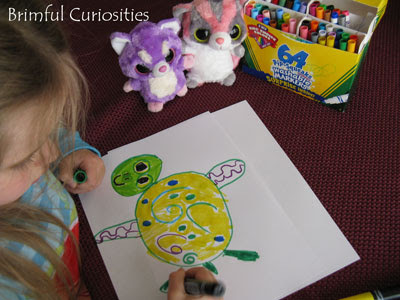 Oh are they adorable and I love that you can use them to teach about endangered species! My girls just started a service project to help save the Polar Bears habitat. (all on their own, which is so powerful- Mom's not telling them what to do! lol)Hope we win! Those are seriously so stinkin cute! Heck even I want to play with them! I think the Jaguar would make a good addition! But I'm all about the cats! I've always been a fan of the manatee or snow leopard! My daughter suggested the Gray Bat which is endangered in our state (MO) and probably other places as well. Perfect teaching tool about endangered species! Please count me in! I would love to be surprised with whatever animal I received if I won a Yoohoo Friend. They are just so cute. How about a short-horned lizard? I haven't seen one of those around here in years. They were everywhere when we were growing up. I love yoo hoo and friends! :) A white lion would be gorgeous. Black footed ferret of course!! Not sure if this is an endangered species but it is on the American Bird Conservancy Watchlist. I sure miss hearing the whip-poor-will that I heard every evening in the summer on the farm growing up. Whip-poor-wills have declined by 57% in the past 40 years. How about a white tiger? I think it is so wonderful that Aurora World, Inc has based this line of cute, huggable animals mostly on animals that are listed on the 'endangered species' list. This is a fantastic way for children to learn about endangered animals, their habitats, and perhaps ways in which all of us can help change the environment to keep these animals from disappearing forever. My 6-yr-old granddaughter has one of these cute 'furry friends' - she has "YooHoo", who is a Bush baby from East Africa. She sleeps with YooHoo and when she first introduced me to YooHoo, her 1st comment was: "He's endangered, you know." I would like to see a Manatee. I'd love to see an Ocelot as a YooHoo. A panther would be great! The Texas Ocelot would make a good one. These are so cute, my kids would love them, thanks! I think a bald eagle would be neat, I think they are still endangered. I think Tree Kangaroos should be YooHoo-ed. I think a bald eagle would make a good YooHoo & Friends character.